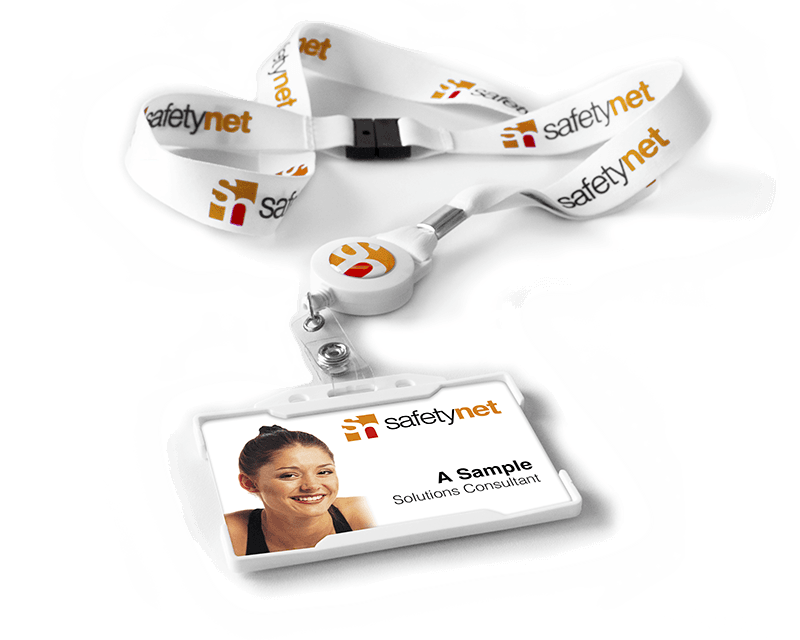 At Safetynet, we provide food businesses with all the necessary visitor and contractor management systems along with a comprehensive range of ID accessories. Food handling is one of the most heavily regulated sectors which places clear Health & Safety responsibilities on employers and managers alike. The law requires “…the exclusion of anyone from entering the workplace if they have an infection that can be passed on through food and there is any likelihood of them contaminating food either directly or indirectly.” This applies to both employees and visitors to site. So when you consider that food businesses also have a duty of care to vet and report who’s on site at any one time, a watertight management system for all types of visitor is vital if you are to comply with the law. Health & Safety legislation, unlike conventional English law, requires you to prove your innocence, so the implications of getting things wrong are serious. So how can you comply with the regulations and keep on the right side of the law? We work closely with you to tailor the right solution for your sites and specific needs. We can do this because we are the only company in the UK to supply a complete range of Visitor Management, Control of Contractors and Staff ID and Access Solutions, across both software and print. We design, develop and manufacture in-house the UK’s most comprehensive range of print solutions. 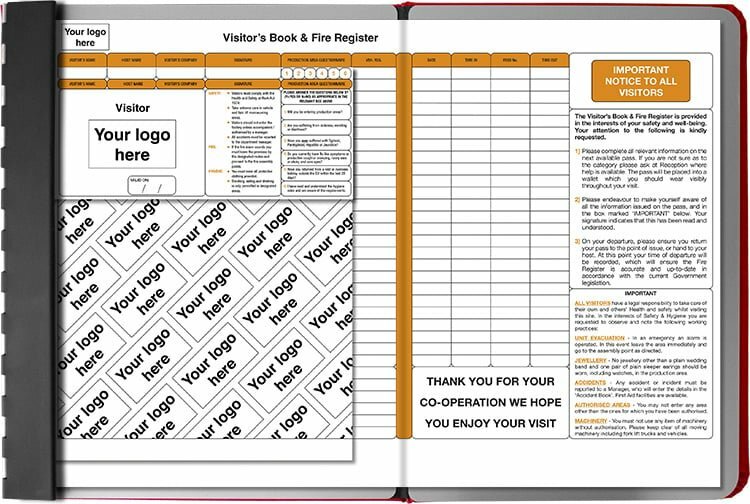 Our cost effective paper based visitor systems can be fully customised to include your corporate branding, Health and Safety instructions and additional data entry fields. Branding can also be added to the passes and the data protection sheet on our One-Write system, making it completely unique. To help you with the control of contractors, we have management systems to suit your needs and budget. From basic record keeping to permit to work issue and control. In SkyVisitor, we have the leading global software solution with no equal. This market leading visitor and contractor software is tailored to suit the needs of your food business. The software includes customised visitor instructions, Health and Safety notifications, and the option to capture photos and print out visitor badges. We are constantly delivering new software features for SkyVisitor – a recently released example is an Authorised Access Questionnaire presented upon entry. This unique feature helps you exclude unnecessary visitors and maintain health and hygiene standards. This is intended to be used in conjunction with a touch screen device at point of entry. Questions can be asked to establish the health status of the visitor, allowing them to be analysed against a pre-determined criteria before authorising access. The SkyVisitor system will help keep all visitor records and hygiene questionnaires in one place and produce statistical reports, saving you time and money. Read our blog: Do your visitors pass Health and Safety requirements? Provide an accurate audit trail with SkyVisitor. For more information on SkyVisitor and how it can streamline the check in process for visitors and contractors to your site, get in touch or go straight to our dedicated website here. We have a comprehensive range of ID accessories including lanyards, attachment clips, yoyos (badge reels), card holders and wallets to be used with ID cards or paper passes to ensure all staff and visitors are recognisable on site. Most of our accessories can be branded and made bespoke to your company with logos, brand colours and can even be Pantone colour matched. Get in touch to see how we can help with your staff and visitor identification! Click here to view our ID accessories range. 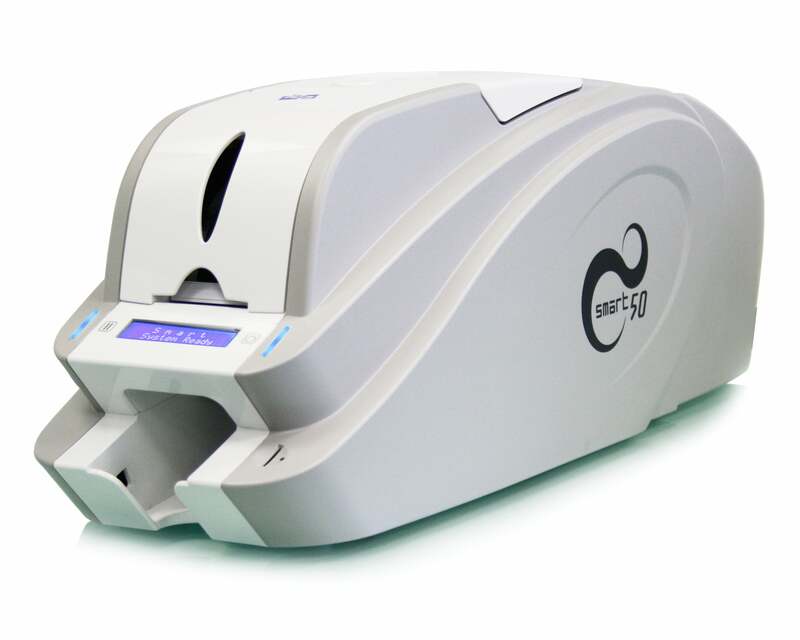 ID Card printers on site can be used independently or with the SkyVisitor system. We can supply your business with PVC card printers, PVC cards, inks and ribbons from big brands such as Smart, MagiCard, Evolis, Datacard, Fargo, Javelin and more. Click here for our full range of card printers and here for more information on our PVC ID and access cards. Additionally, our card printers can be used to produce eye catching notices or price labels on the spot! Unusual combinations of coloured cards and printer ribbons can make attractive point of sale cards to bring attention to offers, prices or any other information you want! The process is quick and easy and would be perfect for retail store chains, catering professionals and local retail shops, including butchers, caterers, bakeries and cake shops, cheesemongers and fishmongers. To speak to us about card printers, PVC cards and ribbons, simply drop us a message or give us a call on 01270 508 550! For efficient management of your building and to help improve safety, we can supply a wide range of building signage. 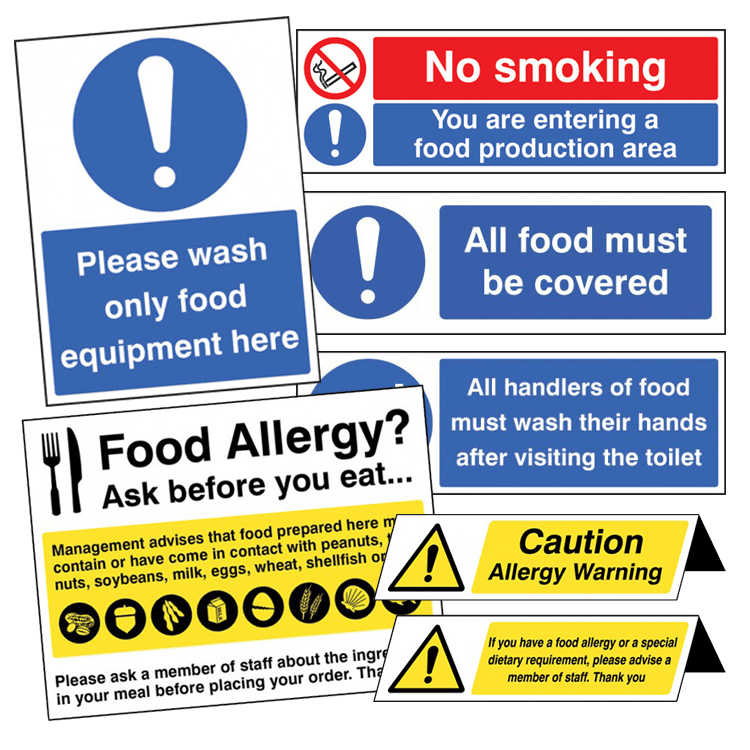 We stock the full range of safety signs: from hazard, prohibition and traffic management to general information signage. Click here to visit our dedicated signage website. Our range of personalised products help create a professional and recognisable corporate image for the food industry. Choose from a selection of printed visitor systems and extensive range of ID accessories which can incorporate your logo, colours and motto as well as any relevant health and safety information. Our electronic visitor management system SkyVisitor also enables you to incorporate your company branding, relevant health and safety information as well as visitor instructions and customised printed ID badges. Our paper based and electronic solutions enable you to efficiently manage your visitors and contractors; logging arrivals and departures. The electronic SkyVisitor system additionally allows the pre-registering of visits and can produce statistical customised reports to enable analysis of visitors and contractors over a period of time. All our visitor management solutions can be scaled to suit your budget and business needs. With SkyVisitor, additional features such as badge printing and SkyTouch can be added for increased functionality along with multiple receptions and site locations. Health and Safety screening questionnaires have been developed specifically for the food industry. This feature prevents unauthorised visitors entering your building and is available with both our paper based and electronic systems. 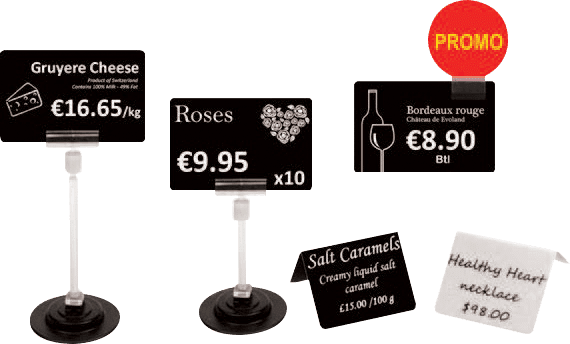 We offer a fully comprehensive range of visitor management solutions and complementary accessories for the food industry at competitive prices. Our printed products are made in-house, meaning there’s no mark up from suppliers, guaranteeing you the best prices on the market.